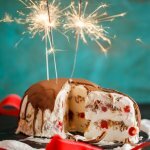 An ice cream bombe with layers of ice cream, salted caramel, chocolate, nuts & cherries topped with even more chocolate is a perfect festive dessert. 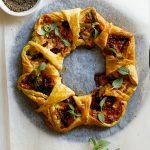 When it comes to festive entertaining, I feel like I have appetizers, canapés and mains sorted. I have a few go-to recipes that I know are sure to wow the crowds. But when it comes to dessert I’m always stumped. First of all, dessert has to be the course that I am done with way before the guests even arrive. I will not be brûléeing anything just before serving. Nor will I worry about a tarte tatin baking in the oven. But I also don’t want the grand finale to be underwhelming. 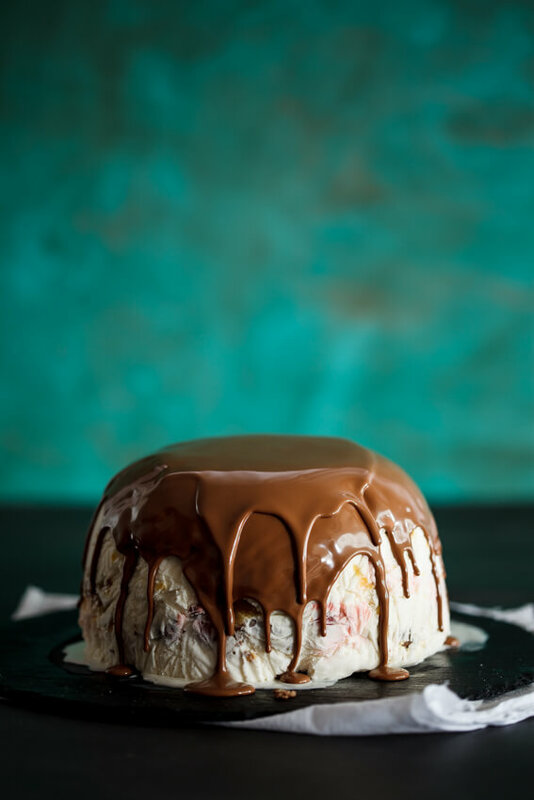 That is where this ice cream bombe comes in. Honestly you guys, you can’t ask for an easier yet more impressive dessert. Pretty much every element is shop-bought (you could even buy the salted caramel if you didn’t feel like making it yourself) and it’s just an assembly job. I do it a few days before the party so that it can set rock solid then I do the chocolate drizzle a few hours before, set it on it’s serving plate and pop it back into the freezer until I’m ready to serve. 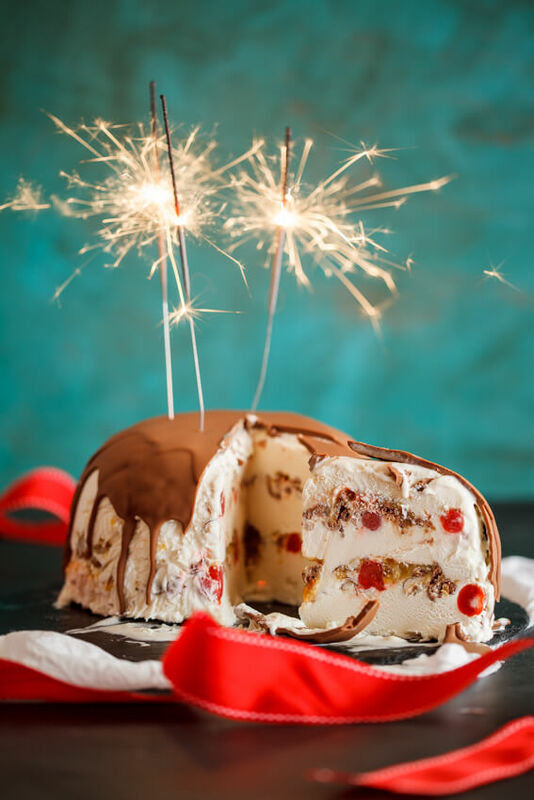 The great thing about an ice cream bombe is that it’s also totally customizable. You could literally add anything you want. Mix up the types of chocolate, nuts, fruit and other candy you pop in there. And for the holidays, the more the better. Pop in a few sparklers just before serving and you have Christmas on a plate! Line a freezer-proof bowl with a double-layer of clingwrap. Place a third of the softened ice cream into the bowl then top with half of the salted caramel, crushed chocolate, cherries and hazelnuts. Repeat the steps until all the ingredients have been used. 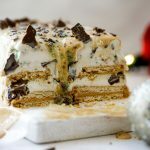 You should be left with 3 layers of ice cream with two layers of filling. Cover the ice cream well then place in the fridge to set for 24 hours. To make the chocolate topping, melt together the coconut oil and chocolate and stir until smooth. 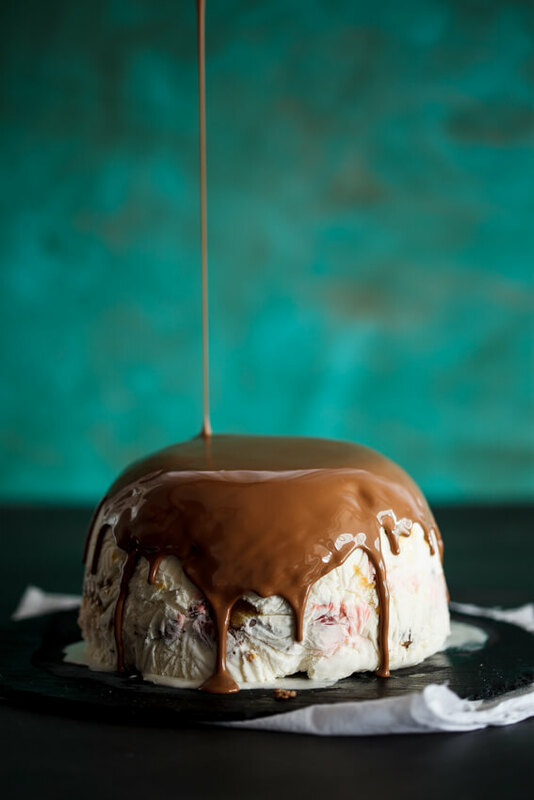 Unmould the ice cream bombe onto a freezer-proof serving plate. Pour over the melted chocolate then place back in the fridge for at least 5 minutes but up to 2 hours. My kids would go crazy for this bomb and I love that Magic Shell like topping. So cute with the sparklers! Thanks Karen! That shell is everything! What a fun idea for a holiday dessert Alida! So decadent! I think I’ll be making this for Christmas Eve but as we are all chocoholics chocolate ice cream will have to be used. I love that sparkler photo. It looks so festive. This has to be the ultimate Christmas pudding. Thanks so much Ilze. It is just perfect for Christmas. What a lovely idea! I think this is a perfect Christmas Day dessert. Thanks Barbara. Indeed it is!